Near Field Communication (NFC) currently is one of the most promising technologies in handsets for contactless applications like ticketing or payment. These applications require a secure store for keeping sensitive data. 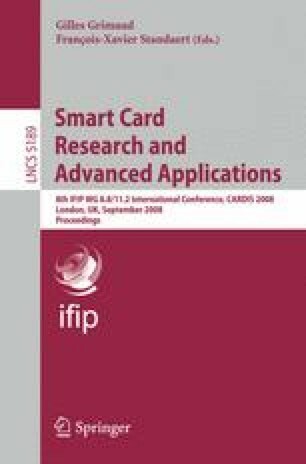 Combining NFC with integrated smartcard chips in a mobile device allows the emulation of different cards. Representing each secure element with different UIDs poses several problems. Thus we propose an approach with a fixed UID dedicated to a Secure Element Controller (SEC). This approach allows an optimized backwards compatibility to already established reader infrastructures but also the communication in peer-to-peer mode with other NFC devices. Additionally the communication over peer-to-peer as well as the internal mode of secure elements at the same time is possible. This is approach poses a flexible alternative to the implementations proposed so far. In addition when there are to multiple, removable secure elements in a device it is ensured that the secure elements are only used by authorized user/devices. The SEC in this case handles the communication between the secure elements as well as their authentication.